MYC is the name of a gene that promotes cancer. We’ve known this since the 1970s. Trouble is, MYC is also necessary for growth, so we can’t eliminate it, and we’ve been very careful about targeting targeting MYC for inhibition, except in the extreme case of cancer patients. That’s why we didn’t learn until last week that mice with half as much MYC live longer and seem healthier in every way. The standard theory of why we age is called “Antagonistic Pleiotropy”, a fancy way of saying that nature has been forced to compromise. Natural selection rewards long life, it is true, but also rewards rapid growth and high fertility. It is genes like MYC that force nature into a kind of devil’s bargain, accepting a cancer risk (and a shorter life) as a necessary concomitant of growth and fertility. This idea was a gift of George Williams , last week’s featured celeb here at Aging Matters, and for more than 50 years it has been so well-established that scientists presume–not just evolutionary scientists, but also clinicians and medical researchers presume that nature has done her best by us, and we oughtn’t to tamper with the mix of genes that Nature has bequeathed us. Most interventions that extend life span in mice work by dialing up the stress response system. This is the mechanism of hormesis, a beneficial over-compensation to stress. Caloric restriction is the most common and most consistent way to activate this pathway. So it is interesting to note that the mice with reduced MYC did not have increased stress response, nor did they eat less than normal mice. 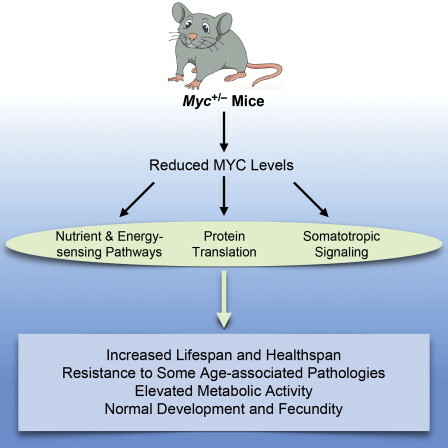 This suggests that the life extension benefit of reduced MYC might be able to synergize with caloric restriction to offer additive benefit. Life span was extended 20% for females, 10% for males. This, too, is unusual, in that, where there is a difference, other interventions commonly extend male life span more readily than female. MYC is a “transcription factor”, which means it acts by turning other genes on and off. In fact, MYC is one of the most powerful, broad-action transcription factors, with effects on the activities of thousands of other genes. One hint about the mechanism of action is that reduced MYC leads to less active ribosomes, the organelles in which proteins are transcribed. MYC+/- animals have less of every kind of protein, and it is no longer surprising that this leads to extended life span. MYC has been identified in the past as an intermediary that is necessary to help turn on telomerase activity in response to caloric restriction and mimetics (drugs that act like CR). The Brown team was encouraged to report that mice with half their MYC missing did not lack for telomerase. What can be done for people who are unfortunate to have been born already with two copies of the MYC gene? That MYC is overexpressed in cancer cells has been known a long time. Much of the work on MYC and how to turn it off has been done in the course of a search for effective cancer treatments. Peter Vogt’s lab at Scripps Inst in La Jolla has led this charge. They have searched through thousands of small molecules, looking for chemicals that “turn off” MYC or interfere with its actions. Here is a paper that catalogs dozens of small molecules that have been studied for their ability to either stop MYC from being transcribed or inhibit the MYC protein from acting. I was amused to note that the standard notion of a “small” molecule extends to include a great deal of complexity. The standard for “small” is scaled by protein macromolecules that are fold from thousands of chained amino acids. But the abundance of candidate molecules isn’t necessarily good news. It means that researchers have followed a well-worn path and pursued many candidate drugs, all with limited success for one reason or another. It is rare to discover death genes, pure and simple–genes that have no other purpose than to kill us. Such genes are known (or suspected) in worms [ref] but not humans. But the list of genes that have been co-opted for programmed death is substantial. I have reported some here last year: TOR, NFk-B, IGF-1, wnt etc. These genes are over-expressed, especially in old age, with consequences that are purely detrimental. They make attractive targets for anti-aging therapy. In other words, death on a schedule is programmed into our genes, but not with specific “time bomb” genes. Rather, the program works by co-opting genes that have other uses early in life, but that are deployed for the purpose of self-destruction late in life. The classic example is inflammation, which is an important mechanism of defense, but which is loosed upon healthy cells, causing cancer and dementia late in life. So MYC is one of those genes without which we can’t live and grow, but late in life it slips its leash and causes great damage. It might serve us well to keep MYC under tighter control, if we can find a practical means to do so. I am grateful for this and many ideas to Reason over at FightAging! web site and newsletter. Week after week, he does a superb job of collecting and summarizing news and research in the field of anti-aging medicine. His viewpoint is a bit more mainstream than my own. * Readers of this page may be interested in subscribing. an article about parabiosis experiments with “young blood”. * Where he sees damage that the body suffers despite its best efforts to resist, I see epigenetically progammed self-destruction. Last month, an NYU Med School doc published an article saying that our gut bacteria might be evolved to promote our digestion when we’re young, but kill us when we’re old. This sounds like evolutionarily programmed death–just the kind of thesis that I have been promoting for 18 years. The article was picked up by Scientific American, Psychology Today, Science News, and Eurekalart of the AAAS. Why am I not cheering? In 1966, a smart, confident young biologist named George Willliams wrote a book that changed the culture and methods of evolutionary biology. Up until that time, evolutionary biology had been primarily a qualitative, observational science, in the tradition of Darwin. (There is not a single equation in any of Darwin’s books.) Practitioners had absorbed the message that natural selection was about gaining an advantage in survival or reproduction, and this was the lens through which they looked at biological function and behaviors. When they found a subtle or unexpected advantage of this sort, evolutionary biologists were excited to report a new understanding of a phenomenon which perhaps had not made sense hitherto. This was wishy-washy, 19th Century science. But on a parallel track, having almost no communication with the field biologists, there were a handful of evolutionary geeks–scientists who were trained in mathematics or physics, and who took up evolution in the same spirit, using methods borrowed from theoretical physics. In the early 20th Century there were Alfred Lotka and R. A. Fisher and Sewall Wright, and in the mid-century there was J. B. S. Haldane and Theodosius Dobzhansky (just to pronounce his name makes you fitter) and Wright just kept on keeping on, writing and researching until his death at age 98. These men had developed a quantitative science of evolution called “the new synthesis” or “neo-Darwinism” or “population genetics”, but their numbers were few and they tended to think abstractly, without a deep knowledge of biology in all its messiness, and so their influence on the larger biological community was quite limited. Williams’s book heralded the merging of these two spheres of evolutionary science. think about the actual mechanisms by which an adaptation might evolve. These were much needed disciplines, and Williams had the commanding, incisive writing style to bring his point home to a community that had become accustomed to field biology as a descriptive science. Every new trait that appears begins life as a random mutation in one individual. If the mutation promotes survival or reproduction, it will spread through the population, otherwise it will gradually die out. Suppose a mutation arises that is bad for the individual’s fitness, but offers a benefit to the community. (This is the definition of evolutionary altruism.) In theory, this trait might help a group to compete successfully against other groups that did not have the trait. But its first hurdle must be that it must come to dominate the group. But every individual who carries the trait is at a disadvantage compared to other individuals in the group. So the new gene faces an uphill battle in its first step, and it is likely never to get to the next step, where it can show its stuff in group-against-group competition. Therefore altruistic traits are unlikely to survive natural selection. When we write these assumptions out explicitly, it’s clear that sometimes they are true, and sometimes not. Sometimes the Selfish Gene model does fine, and sometimes a more complex and sophisticated model is called for. If we take to heart Williams’s deeper message, then when we find traits in nature that look like altruism, we should consider all mechanisms by which it might have evolved, evaluate them quantitatively, and decide on the most plausible evolutionary explanation. It was right, of course, that the field biologists and the evolution geeks should talk to each other. They purported to be studying the same subject. But what should have happened (in my couterfactual history) when the biologists first compared notes with the mathematicians is that the biologists should have had the upper hand. “Here’s where your theory works–here’s where it doesn’t. Go back to the drawing board and give us a more complete theory that explains what we see.” We might have arrived at an understanding of the usefulness of the Selfish Gene, and also its limitations. Whenever there is a conflict between theory and observation, it is theory that must bend. But in real life, this is not what happened. In real life, the mathematicians were smart and brash, and the field biologists were more tentative, nuanced in their understanding, a little embarrassed about the contradictions in their findings, and easily intimidated by formulas. All too often, the mathematicians simply told the field biologists they were wrong, that they were not seeing what they thought they were seeing, that theory forbids it. The theory they invoked was the simplistic Selfish Gene theory, because this was a time before computer models, before the ideas of evolutionary ecology had a platform for development. Theorists did not keep in mind that the Selfish Gene model was just a model, and they insisted that it must explain everything. The message of George Williams survived mostly in its caricatured form. The rigor he required proved to be too demanding for biologists, and two generations of evolutionists took the shortcut of affording credence to any explanation that looked to be based on individual benefit, and dismissed any explanation based in group selection. So this became the era of the Selfish Gene, which is just now winding down, and an appreciation of Williams’s true message is finally spreading through the community. Gut Bacteria and Programmed Death–What does the article say? We circle back now and consider the article by Martin Blaser, microbiologist at NYU, and Glenn Webb, who does computer modeling of biological populations at Vanderbilt. The failed revolution of George Williams sets a stage for all that is effective and all that is missing in Blaser & Webb’s analysis. The age structure of human populations is exceptional among animal species. Unlike with most species, human juvenility is extremely extended, and death is not coincident with the end of the reproductive period. We examine the age structure of early humans with models that reveal an extraordinary balance of human fertility and mortality. We hypothesize that the age structure of early humans was maintained by mechanisms incorporating the programmed death of senescent individuals, including by means of interactions with their indigenous microorganisms. First, before and during reproductive life, there was selection for microbes that preserve host function through regulation of energy homeostasis, promotion of fecundity, and defense against competing high-grade pathogens. Second, we hypothesize that after reproductive life, there was selection for organisms that contribute to host demise. While deleterious to the individual, the presence of such interplay may be salutary for the overall host population in terms of resource utilization, resistance to periodic diminutions in the food supply, and epidemics due to high-grade pathogens. In particular, they cite H. pylori (famous for its connection to ulcers) as example of a bacterial strain that promotes digestion and good health for young humans, but that can lead to cancer of the stomach or esophagus late in life. Perhaps this bacteria serves the function of removing from the population older individuals who are no longer fertile, so that they are consuming scarce food, though they are unable to contribute to the reproductive rate that keeps the community viable. I find the thesis unclear on several different levels. What is evolving here, the genome of the bacteria or of the humans? What is the mechanism by which intestinal bacteria spread through a community? What measure of fitness is applied in the model, and is it the fitness of the bacteria or of the humans? To the credit of these authors, they do not categorically dismiss group selection or programmed aging from consideration. In fact, they claim in the paper’s Introduction to explicitly consider both. But I’ve had a devil of a time trying to figure out how their model works, let alone how it answers the standard broadsides against group selection and programmed aging. I find myself agreeing with Williams in his appeal for clarity and rigor. “Who profits?” The title of the paper is Host Demise as a Beneficial Function of Indigenous Microbiota in Human Hosts, but whose benefit are they talking about? Certainly not the individual human who dies or esophageal cancer, nor the gut bacteria that die with him and relinquish their opportunity to be transmitted human-to-human. The root of the unclarity is that our understanding of the relationship between gut bacteria and the host human is still quite hazy. There is enormous variability from one person to the next in the type and variety of gut bacteria. There are benefits to the host human from some combinations, and diseases that come from others. But it seems that there is no one optimal bacterial community that is right for everyone, but rather that the interactions among an individual’s metabolism, his environment, his diet, and his bacterial community form a complex system. Do the bacteria in our guts serve at the pleasure of the host (that’s us), or are they opportunistic invaders? These are major open questions in the field of microbiology. The answer seems to be “neither”, and the ecology of each person’s bacterial community has an integrity and a logic all its own. It has been a central thesis of my own work that entire ecosystems evolve together. The present example is as strong a case as I can imagine. Each bacterial species much be able to hold its own in the gut ecosystem, and the entire colony must serve the digestive needs of the individual human host, because if the host dies he takes the bacterial colony with him. There is a great deal of selfishness and a great deal of cooperation involved in this dynamic, in a mixture that cannot easily be disentangled. Suppose it is in the interest of the human community to eliminate its non-reproducing elders, but if the H pylori kill their host, then they are missing out on the opportunity to continue spreading from this one individual to others, perhaps younger family members who are sharing food. I look for this issue to be discussed in the paper, and I don’t find it. Indigenous microbial populations that contribute to the health not only of the individual but also of the host group will be most strongly selected…If indigenous organisms contribute to programmed host death in senescent individuals but not to the death of reproductively active individuals, there may be selection for their maintenance. Yes, “there may be selection”…but at what level, and by what mechanism? My guess is that indivdual selection for each bacterial strain and for the human host are all important, and that the communal function of the bacterial colony is also essential, as is the welfare of the human community, and all combinations of interactions among these. This is a standard model for calculating population dynamics, (introduced by Patrick Leslie, 1945). It is the model used by Glenn Webb in the current paper. But missing from this model is the dynamic of population overshoot, followed by famine. This is at once the gravest and most ordinary danger to any population, and the one that (in my view) aging was evolved to defend against. So I worry that Blaser and Webb have left out something important. It is a prediction of classical evolutionary theory that these two should occur at the same time. Why should an individual go on living after it is no longer able to reproduce? It can be of no use either to itself or its community. But in the biosophere, we find this prediction is routinely violated. Of course, human females undergo menopause, and can live for decades thereafter. For theoretical reasons, post-reproductive life span has been thought to be unique to humans, or perhaps a few other social mammals that take care of their grandchildren. But field studies show that this isn’t true. In fact post-reproductive life is widespread in nature–perhaps it is the rule rather than the exception. C elegans worms don’t take care of their grandchildren, nor do quails or yeast cells; yet all of these have been observed to outlive their fertility. Add whales, elephants, opossums, parakeets and guppies to the list as well. How to understand post-reproductive life span is a topic for another week, but Charles Goodnight and I have written about the subject (in journalese) here. In addition to this, there is another paper I suggest that Blaser and Webb might have benefited from assimilating. Once fertility has ended, there is a natural selection to kill the non-reproducing individual, because it is consuming food, taking up space in the niche without contributing to sustaining the community. This idea goes back to Weismann 120 years ago, but in modern times it has been modeled and explained most thoroughly by my colleague, Justin Travis. Curiously, there is also a communal reason to keep the post-reproductive members alive for awhile, in a weakened state, assuming that community has excess reproductive capacity. The post-reproductive segment of the population serves as a buffer to prevent population overshoot and whip-sawing that can lead to extinction. They consumes food when there is plenty, and thus they help keep the population from growing too fast. Then, when food is scarce, they are the first to die because they are old and weak. This is the idea that Goodnight and I modeled and published (2012). For me, the upshot is that I don’t understand enough of how their model works to judge whether they are on to something. I’m tempted to add that computer modeling of aging is my specialty field, and if I can’t understand their model, for whom are they writing? In controversial fields like this, where there has been so much confusion and misunderstanding, it behooves us all to be extra careful to follow Williams’s directives: think (and write) in terms of explicit mechanisms of heredity and selection. Most readers of this work are already pre-disposed to pre-emptively dismiss the ideas of programmed aging and group selection. Let’s not give them an excuse to do that. Most people misunderstand what aging is. It’s not just the public who have been deceived — Most scientists and medical researchers who study aging are on the wrong track. The culprit is the “natural medicine” movement that has dominated thinking about our bodies for the last 50 years. “Respect the body’s wisdom. Work with the body to fix what has gone wrong.” This approach has worked so well with injuries and many diseases that it is understandable that people want to extend it to aging as well. Diseases of aging have been treated as if they were something that goes wrong, something we have to help the body to fix. But in fact, the evidence accumulating in recent decades is that aging is not something that goes wrong, and the body is not trying to fix it. Aging is natural. It is the body shutting itself down, putting itself out of the way after it has done its job, finished reproduction. How do we know that aging is an active process of self-destruction, and not just the body “wearing out”? There are a number of indications, becoming clearer all the time. For one thing, if the body were trying its best to keep in good shape, but can’t help wearing out over time, we would expect that damage to the body makes aging happen faster. On the contrary, most kinds of external damage actually make us live longer. The best example is exercise, which generates free radicals like crazy, tears muscles and puts little cracks in our bones. And yet, people who exercise tend to be healther and live longer than others who don’t. Starvation is also a way to live longer. Animals in the lab that are kept on very low calorie diets live much longer than those that have enough to eat. This is a clear indication that the bodies that get plenty to eat aren’t really trying to live a long time. If the body were doing its best to forestall aging, but succumbing eventually to wear-and-tear, we would expect that as we get older the repair functions would be going full-tilt. But in fact, all our repair and protection systems gradually shut down as we age. Stem cells, which produce new body tissues, gradually stop working. And the anti-oxidants that protect us from chemical damage are dialed down in old age, so we don’t have enough of such enzymes as CoQ10, SOD and glutathione. Clearest of all: there are actually self-destruction mechanisms that we can see in action. One of them is inflammation. When we are young, inflammation protects us from invading microbes, and kills diseased cells; but when we get old, inflammation is dialed up much too high; it kills healthy cells, inflames our arties, leading to heart disease, and inflammation causes cancer as well. Another mechanism we can see in action is called apoptosis, or cell suicide. When we are young, only cells that are diseased or defective remove themselves via apoptosis; but when we are old, healthy muscle and nerve cells simply fall on their swords and die, leading to weakness of muscle, weakness of mind and Parkinson’s disease. This explains why “natural medicine” has been so helpful for infectious diseases, immune function and response to trauma, but in stark contrast natural medicine has failed to make headway against cancer and Alzheimer’s disease, and has made only marginal progress against heart disease and stroke. For these diseases of old age, we need to abandon the natural approach, and instead simply trick the body into thinking that it is younger. Then it won’t try to shut itself down. Every chromosome in every cell contains a time-keeper, tacked onto the tail end of the DNA. This is the “telomere”. Simply by resetting the telomere clock, scientists have produced dramatic results in lab animals, reversing aging and making animals younger. When the telomere clock signals a critical age, the cell becomes “senescent”. It goes and strike and refuses to do its job. Worse yet, it sends signals to nearby cells that cause the other cells to become inflamed and cancerous. Recently, scientists have had remarkable success making mice live longer simply by removing the small number of senescent cells. As we get older, the hormones circulating in our blood gradually change. This is the principal way that the body knows how old it is. There are youth hormones that promote rebuilding and high-efficiency energy output; and there are old-age hormones that turn up inflammation and cell suicide and signal the body to gradually destroy itself. Scientists have begun to have success by increasing the former and decreasing the latter, resetting the hormone profile of an old animal to match that of a young animal. These approaches have not yet made front page news, but scientists in the field already recognize their dramatic promise. If all goes well, we should expect breakthrough treatments that extend life and prevent the debilitating diseases of old age, coming on-line in the next few years. Disclaimer: This is my own perspective, shared by a handful of world-class aging scientists, but it is not yet mainstream. In addition to the two views described here–programmed aging and wear-and-tear theories–there is another class of theories favored by mainstream evolutionary scientists, based on compromises that evolution has been forced to make. These compromises have been made up ad hoc to avoid the inference that aging evolved to benefit the community, not the individual.